Hello! Welcome to my little corner of this place. I’m Wool, a 36 year old guy from over in Staffordshire. More about me will be added to the about section at some point in the near future. Obviously the site is a little bare bones right now, it’ll be built over time as I get more experienced at things and generally be more comfortable, so stay with me here. FM 19 is out! Which is a good place to start, we’re all super excited and starting to take their teams on an epic journey to conquer their respective leagues and, well, I’m no different. I usually take on my favourite club, Liverpool but this year I figured in what might end up being a complete disaster to take on a team closer to home this time around, a team that represents the grand old city of Stoke-on-Trent. A team that is closely followed by the elite celebrities of the world and has won a grand total of diddly squat in history, minus the odd Autoglass Trophy or whatever it’s called now (I want to say Checkatrade). Yes, Port Vale. Located in Burslem (because a place called Port Vale doesn’t exist), one of the 5 towns of Stoke-on-Trent. Previously of Hanley, the City Centre of Stoke-on-Trent, Cobridge and er, Burslem before that. They play their home games at the aptly named Vale Park which, when you look at its history is laughably brilliant. More on that in a minute. Port Vale were first founded in 1876 as an amateur team playing in Longport before moving to Westport then Burslem for a year before going pro and moving to Cobridge. They were founder members of the Football League, Division 2. As is the pattern throughout their history, they completely failed to impress, spending 13 years in the league and a couple of seasons in the midland league before going into liquidation. End of story, right? Nothing to see here. If they went into liquidation, why the hell are they in FM? Well, my friends, you know how I said they played in Cobridge for a bit? Well that only inspired Cobridge Church – an amateur team to change their name to Port Vale when it became available. They soon went pro, moved to Hanley and got back into the Football league, replacing Leeds City. After time though, they decided that Burslem wasn’t so bad after all, I mean they were only there for a year so it is as good a place as any to be a spiritual home, besides, Stoke were in Stoke – way too close. Let’s move away a little bit and forget about the Eviction notice by the council. 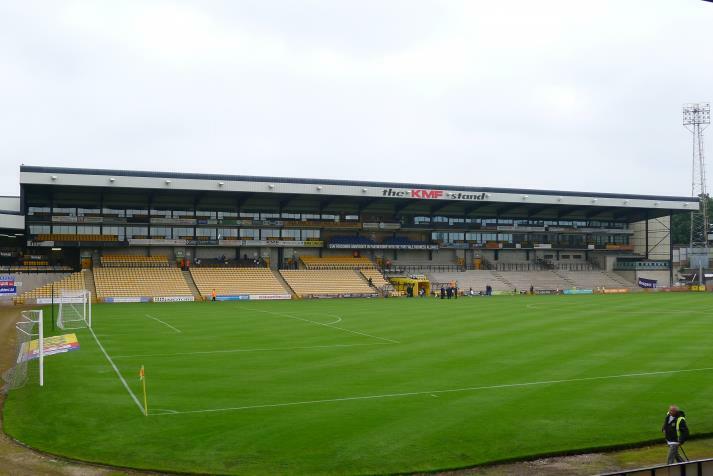 This is where the hilarious history of Vale Park comes in. This was built in 1950, Vale were at their height and they were ridiculously optimistic after being evicted from Hanley. They submitted plans for a “Wembley of the North” an 80,000 spectator stadium which would be the envy of the North, despite being in the Midlands. The pitch was immaculate, the most expensive money can buy – tickets were on sale for £100 so all the movers and shakers could be there. Surprisingly 100 people did go on and buy them, further cementing Port Vale as the celebrity club of Stoke-on-Trent. Unsurprisingly the 80,000 dream didn’t take off, Vale were forced to downgrade their plans to 40,000 because a third division team didn’t have the funds to do this kind of thing, why would they? This wasn’t the last time they went and messed it up either. I mean 4-4-2 magazine apparently wrote in a piece once that Port Vale are “Britain’s most dysfunctional football club”. This is highlighted most by the Lorne Street Stand at Vale Park, which was a partially built stand from back in the day. Someone had the idea in the 90s to redevelop it, finish it off and boost the capacity of the stand to around 8/10,000. It never got finished. They literally fixed an incomplete stand with an incomplete stand. Not much happened since, they were in the Championship for a while in the 90s, slugging it out with Stoke, before they both got relegated and slugged it out some more. Vale even won the Autoglass trophy at some point in time and even played in the Inter Toto or Anglo Italian cup, whichever. They didn’t do well anyway. So yeah, Port Vale have survived more dysfunction than the Kardashians, they were in administration in 2012 but yet still managed to hold on and survive. Their fans are celebrities, pretty much, boasting Phil “The Power” Taylor and Robbie Williams amongst their biggest fans. If you ask any Vale fan though, I’m sure they’ll claim Lemmy and Slash because they lived in Burslem at some point or another or something. They have also set a record – the most seasons in the football league without ever playing in the top flight. Armed with our legions of celebrity fans, our not-quite-completed stadium and pretty much no money, along with a probable dispute with Stoke-on-Trent council and an owner who might or might not own another stadium somewhere in Nuneaton I think, we take on the job at Port Vale with one aim in mind. End that record and get into the Premier League – hopefully before Stoke. Next time, join me while I review our squad (God help us if Tom Pope can’t score) and see what we do in pre season. Wish me luck. Until then, tarra duck.